Many of you know that I, "Sacerdotus" am from the Bronx. I was born in Manhattan, but most of my life was spent in the Bronx. The Bronx is home to many things the world loves. Hip Hop culture with its rap music, break dancing, graffiti art originated in the Bronx. Many famous actors were born and raised in the Bronx, even astrophysicist Neil Degrasse Tyson grew up in the county. 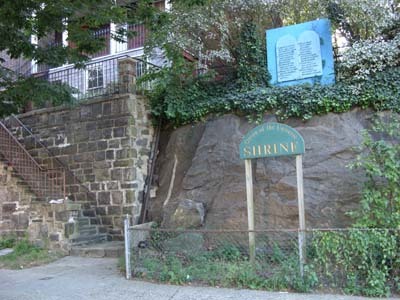 Poet and author Edgar Allan Poe lived there and even in the park that bears his name and where his house is still present is the birthplace of Batman. I can go on and on, but you get the point. The Bronx is awesome! It has a bad reputation due to the portrayal of the borough on television and movies. However, there are many good things about the place. What I may about to announce may come as a shock to some readers or maybe all. Did you know that the Bronx is also known for a Marian apparition? Yes, the Blessed Virgin Mary is said to have appeared in the Bronx. While the apparitions are not approved by the Catholic Church, they were not condemned either. As a former atheist, the suggestion that the Virgin Mary even appeared in my hometown intrigued me. While I am a skeptic and do not believe things at face value, this does not mean that I automatically reject claims. I vet things and test them to see the truth and accuracy behind them. I do not believe that being an incredulous skeptic is good. It is self-defeating. I used to walk by the stop of the apparition when studying at CUNY and going to nearby Lehman College to use the library. The Bronx is home to a huge avenue or boulevard called the Grand Concourse. This huge road was envisioned by Alsatian immigrant Louis Aloys Risse. The project was begun in 1894 and finished in 1909. Afterwards, many art deco buildings were built alongside the Concourse which stretches from the South Bronx to the north Bronx. These buildings contain art and housed Jewish, German, Irish and Italians unto the 60's when they began to move to the suburbs. Puerto Ricans and African Americans replaced them afterward until the late 90's when Dominicans and others began to move in. Today, many of these buildings have remnants of those who lived in them such as Jewish Mezuzahs on the doors of apartments. There is even old synagogues still present on the Concourse which houses Protestant sects such as the Baptists, Adventists, and Pentecostals. However, further north on 3191 Grand Concourse is a small pot of land with a boulder left over from the last ice age. It was here where Our Lady is said to have appeared. According to my research, on the Monday 29th of October in 1945, a young boy of 9 years of age claimed to have seen a woman on a vacant lot just behind his home on Villa Avenue (Blue house on 3194 Villa Ave). 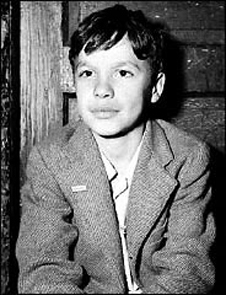 The apparitions were daily, according to the boy named Joseph Vitolo. Vitolo was an Italian born to Italian immigrants. 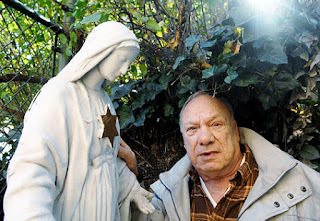 He claimed that this woman was about 5 feet tall and was dressed in a similar manner as Our Lady of Lourdes of Fatima (Fatima Apparitions did not occur then, I mention it for reference only). 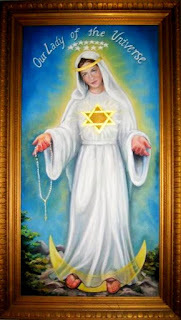 He described her as wearing all white, standing on a crescent moon holding blue Rosary beads with a Magen David (Star of David) on her chest and wearing a 12-star crown. On other occasions, she wore all blue (light blue) and pink and black. The lady came to be known as Our Lady of the Universe or Our Lady of the Concourse. As news spread, many thousands flocked to the spot in hopes of witnessing or experiencing something supernatural. 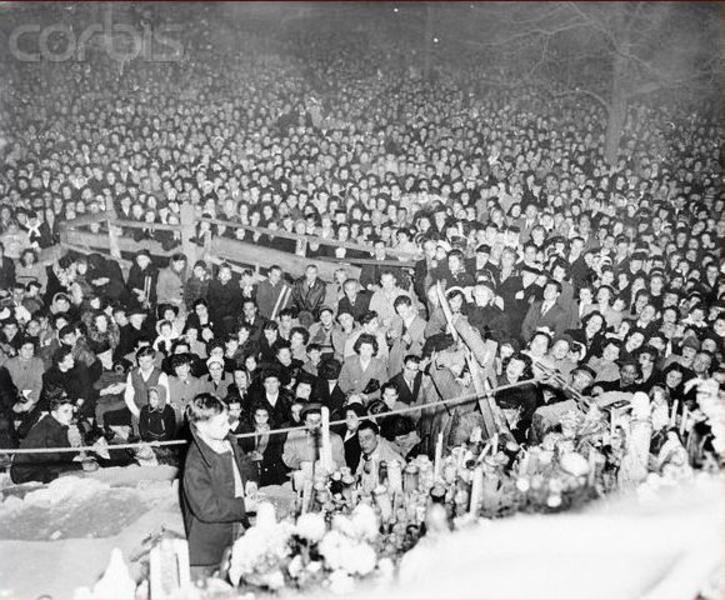 In fact, as many as 30,000 packed the Grand Concourse praying the Rosary and hoping for a sign or miracle. Some claimed to have experienced healing or other miracles. However, I have not found any medical documentation proving the claims. Nevertheless, this does not mean they did not happen. The media even covered the apparitions. Among them were Time and Life magazines. Other periodicals cover the story including Catholics ones, the Bronx Home News, New York Journal, New York Post, New York Herald Tribune and New York Times. Interestingly enough, the Archdiocese of New York did not bother investigating the claims of Our Lady appearing in the Bronx on the Grand Concourse. Neither did they condemn it or barred Catholics from participating. To my knowledge, no warning was given to clergy about it as well. However, priests from the nearby parish of St. Philip Neri did not provide services for the shrine that was eventually built on the site. Whether or not priests did visit is not known. Maybe they did and did not wear clericals or maybe they just ignored it as a fad. I have not found evidence either way. The apparitions did not contain any secrets or major supernatural messages other than a request to pray the Rosary for peace. There was no promise of a warning, sign, miracle or anything supernatural. The request was simple and prayerful. On one occasion, Our Lady asked Vitolo if he knew who Bernadette was. He replied that he did not. She told him to do as she did. On another occasion, Vitolo claimed that Our Lady had beads that broke. She bent to pick them up and told him that one is missing. No one seems to understand the meaning of this incident or if it were Rosary beads that broke either on purpose or by accident. The incident remains a mystery. Our lady even told Vitolo that if he studies hard, goes to church, prays that he will be cleansed of his sins and can become a priest. She also said that the people should build a church on the spot of her appearance. It is interesting to note that Vitolo did enter a seminary but did not find the experience great. Moreover, no church was built on a spot. Instead, a makeshift altar was built and statues added to create a private shrine of sorts. Vitolo stated that he would pray the Our Father, Hail Mary and Glory be and then Our Lady would make her appearance before him at around 7:00 PM. She would appear to him for about 5 to 10 minutes; however, observers around him claimed that he was there for almost an hour in ecstasy and without motion in a stance of prayer. During the apparition, those present claimed that all the votive candles on the spot turned off except for the one in the center. 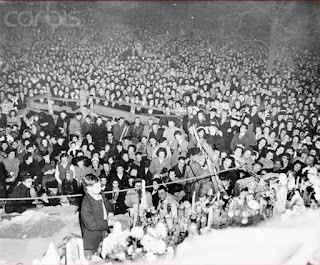 There was one moment on Halloween October 31, 1945, where some in the crowd voiced their disbelief at the child and then the votive candles would turn off without interference from anyone or anything visible. This would silence the skeptics in the crowd. On the last night of the apparitions, some claimed to have witnessed the "sky opening" and what looked like an angel descending. Others did not see the alleged angel, only the sky opening while some claimed to have seen the Virgin Mary ascending into the opening. After 1947, interest in the shrine and apparitions began to decline. Today, the remnants of the shrine remain. I am not sure if it still accepts visitors. They do not solicit donations or anything of any kind. Vitolo himself did not earn a dime on the apparitions and struggled to find a good paying job as he got older. I am still researching this apparition and will update this post as I learn more. To date, I have not found anything contrary to Catholic doctrine in these alleged apparitions. Again, the Church has not condemned them. On a personal note, I find this apparition cool and love the titles of Our Lady of the Universe and Our lady of the Concourse. It brings to mind my love of astrophysics and astronomy. Moreover, the Star of David on her chest captures my attention especially after finding out via AncestryDNA that I have Jewish blood in me via my maternal side. I am still trying to find out why Our Lady alleged appeared with the Star of David. Could it be because she was a descendant of David and her Son is a King in the line of David? Could it be because the Grand Concourse had a large Jewish population and Our Lady was acknowledging this? I do not know. Hopefully, I will find more information and will update this page and restart the www.OurLadyoftheUniverse.com website after seeing that it has been inactive. If Our Lady really did appear in the Bronx, I must spread the word! Furthermore, it seems Satan tried to stop me from making this post. As I wrote this, half the post was deleted. I clicked "undo" and could not retrieve the original text I wrote in a draft. Afterwards, an outlet extension nearby began to spew sparks, flames, and smoke out of nowhere. Nothing that uses heavy wattage was plugged into it. I am still trying to figure out why it did that. In any event, Satan can go to hell, I will not stop promoting devotion to Mama Mary. Here are videos of an interview done where an older Joe Vitolo answers questions. Jospeh Vitolo still remained in the Bronx. I was hoping to contact him but learned that he passed on to the Lord in 2010. He is now with Our Lady again. May he rest in peace. I have control of www.ourladyoftheuniverse.com and am currently building it up. If you were present during the alleged apparitions, have verifiable information on it or know someone who was there and has verifiable information, please contact me: Contact@sacerdotus.com or ourladyoftheuniversebronx@gmail.com. I met the daughter of Joe Vitolo. Her name is Maria. 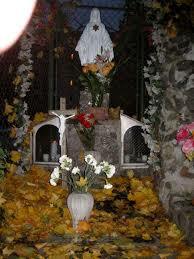 She shared many new details about the apparitions which I will post here.